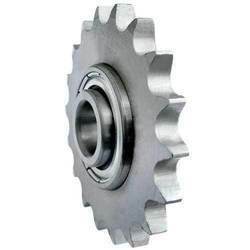 We are engaged in offering industrial sprocket wheel. We are the leading manufacturer and supplier of Conveyor Sprocket. Avail from us sprocket wheel for conveyor, machines etc as per the requirements of our clients. The velocity is constant to some extent. Power is transmitted, in this case over a shorter distance than in the case of belt or rope drives. These can be made available to our clients at industry leading prices. We are the leading manufacturer and supplier of Standard Sprocket Wheel. They engage chains in many different power transmission and conveyor systems. Sprockets is a profiled wheel with teeth that meshes with chain, track or other perforated or indented material. It has ability to escalate the operations of lawn mower. Chain Sprocket (Simplex, Duplex, Triplex) is a product offered by us. 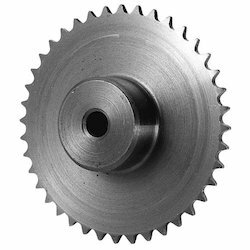 It is distinguished from a gear in that sprockets are never meshed together directly, and differs from a pulley in that sprockets have teeth and pulleys are smooth. Sprockets are of various designs, a maximum of efficiency being claimed for each by its originator. Sprockets typically do not have a flange. Some sprockets used with timing belts have flanges to keep the timing belt centered. Sprockets and chains are also used for power transmission from one shaft to another where slippage is not admissible, sprocket chains being used instead of belts or ropes and sprocket-wheels instead of pulleys. They can be run at high speed and some forms of chain are so constructed as to be noiseless even at high speed. Looking for Industrial Sprocket Wheel ?